Colt Model 1908 Vest Pocket .25 ACP Double Cased Set - These guns are serial numbered 334651 & 334653 and were part of a 50 gun shipment to Wolf & Klar, Ft. Worth, TX on December 4, 1923. Serial number 334652 was not in the shipment. 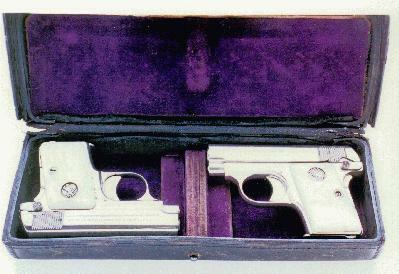 Both pistols are factory nickel plated with Type III mother-of-pearl grips (square-top with recessed medallions). 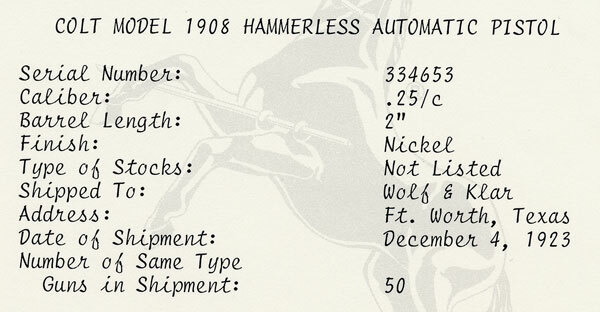 Colt Model 1908 Vest Pocket .25 ACP factory letter for serial number 334651. 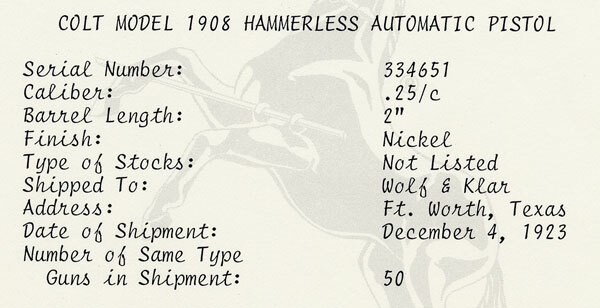 Colt Model 1908 Vest Pocket .25 ACP factory letter for serial number 334653.